Many buyers are unaware of the processes involved with purchasing property, especially first time home buyers. Even if you have bought and sold property before, you may learn something from this information. In the state of Indiana the laws were originally written that REALTORS® solely represented the sellers and it was simply “Buyer Beware” for those wishing to purchase real estate. As this was obviously a one sided professional representation, many buyers were taken advantage of by sellers who had professional representation. 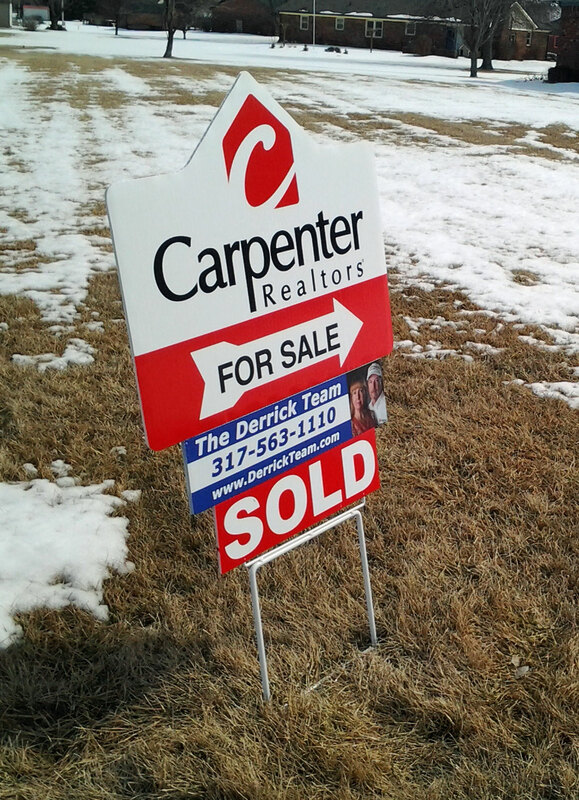 Finally the Indiana lawmakers, following the lead of many other states created the “Buyers Agency” provision in the law so now buyers could choose to be represented by a their own agent in real estate transactions. Now for the best part, it costs you nothing to be represented by a REALTOR® as the buyer. The local REALTOR® boards (in central Indiana it’s MIBOR) worked out a system so the seller pays a commission fee and then this is shared between both the seller and buyer’s agents. So the agent representing the buyer is paid a Brokers Agency Commission (BAC) percentage by the seller and both sides receive fair professional representation, each agent working for the best interests of their client. Now you know it costs you nothing, what do you get for this great price? First, you get a REALTOR® who will be able to get you more information on property than you would otherwise. They have access to more information through their professional association with the local REALTOR® board. Second, you will have someone who will work with you to determine your needs and desires and be able to efficiently search for the available properties saving you valuable time. They will be able to weed out properties that don’t fit your requirements so you can focus your search on great potential matches. And most importantly, they will be there to represent you during the negotiations for the property you chose to buy. Even after your offer is accepted there are many things your REALTOR® will be helping you with, all the way up to the final closing and possession. Now you know you need a REALTOR®, find one and stay with them. Loyalty is important to make sure you get the best service possible. Finding the right home is not an easy task. If you are a potential buyer, there are numerous hurdles to be jumped before you finally move into the home you really want. It’s in your best interest to be represented in one of the largest purchases you’ll ever make so finding a good REALTOR® is an important first step. The Derrick Team would love to talk to you on how we can help you purchase your home. Some buyers like to leave their name and needs with four or five sales people. Although this sounds like it is to the buyer’s advantage, it’s really not because when a buyer is not committed, none of those agents are going to be spending any extra effort on that buyer’s behalf. You must keep in mind a REALTOR® does not get paid (by the seller) until you actually purchase a home using them to represent you in the transaction. So if you are committed to working with us, we will work closely with you to find that perfect dream home you’ve been looking for. 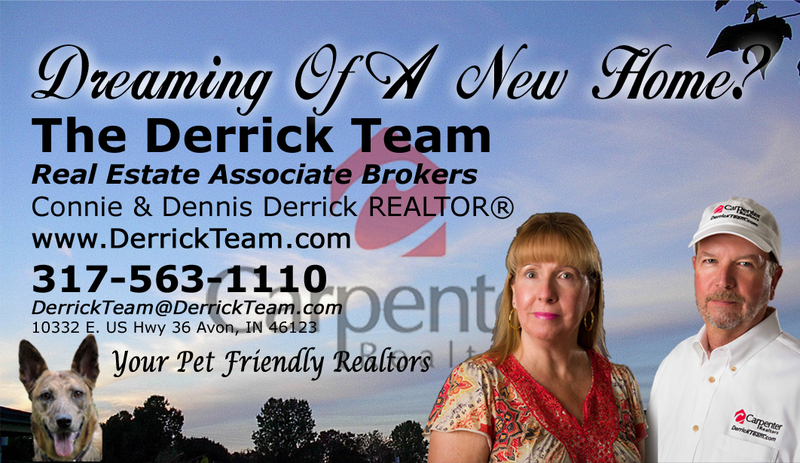 With the Derrick Team you will have a dedicated team (Connie & Dennis Derrick), who will take on the professional responsibility of handling all the details of your upcoming home purchase needs. We will adhere to the National Association of REALTORS® Code of Ethics in representing you, our client. In return, we only ask for your loyalty so we may stay committed to helping you in home purchase needs. And keep in mind, our services are paid for by the seller of the property you ultimately purchase, so it costs you nothing! We at The Derrick Team love working with buyers no matter what price range. From first time home buyers to those looking for acreage in far out rural areas we are glad to help. Give us a call or text us anytime at 317-563-1110 and we’ll be glad to meet with you to discuss your plans and options for purchasing a new home! Based out of Avon Indiana we serve Hendricks County and the surrounding Indianapolis Metropolitan area. Still not sure, we offer FREE ‘one on one’ home buyers consultations. Click here for details! Here is a flow chart that explains the basic process of buying a home. Check out more about financing here.